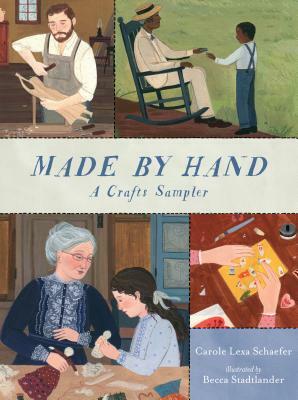 A beautiful, one-of-a-kind volume invites readers to marvel at the time, effort, and care that went into creating handmade toys, tools, and treasures of the past. Whirr, buzz, hum. Before busy machines in factories turned out most of what we need and use, people crafted these items by hand. From a globe to a pie crimper, a butter churn to a rocking horse, this unique collection highlights fourteen one-of-a-kind objects — each one drafted, stitched, painted, or engraved by hand. Author Carole Lexa Schaefer draws inspiration from real historical artifacts to create thirteen short works of fiction, imagining the hands that might have made and used each item. Several artifacts can be traced to their origin, while others remain complete mysteries, making for a fascinating patchwork of fact, guesswork, and imagination. Illustrator Becca Stadtlander breathes color and charm into this handmade history, bringing to life the different objects, people, and times. The result is a singular glimpse of everyday objects and treasures alike — back when such things were made by hand. Carole Lexa Schaefer is the author of numerous books for young children, including Down in the Woods at Sleepytime, illustrated by Vanessa Cabban; the board books Ciao, Baby! Ready for a Ride and Ciao, Baby! In the Park, illustrated by Lauren Tobia; and the Monkey and Elephant series, illustrated by Galia Bernstein. Carole Lexa Schaefer lives on Camano Island, Washington. Becca Stadtlander received her BFA in illustration from the Maryland Institute College of Art. She is the illustrator of On the Wing by David Elliott, Things That Grow by Libby Walden, and Sleep Tight Farm by Eugenie Doyle. Becca Stadtlander lives in Kentucky. A carefully designed book that brings the past and the hand-created objects of the past to full-blooded life. Schaefer spotlights 14 handmade objects, crafted between 1798 and 1950, focusing on the circumstances of their creation and use...Stadlander's colorful folk-style paintings are rendered in gouache and feature numerous setting details. Spreads are appealingly designed using multiple panels that suggest quilt blocks. Children will be intrigued to learn of the origins of 14 one-of-a-kind objects in 13 stories told on double-page spreads...Children exploring this period in American history will be fascinated with the material and find much for discussion in classrooms.